In 2013, David Cordtz, a cidermaster and wine maker, teamed up with his son, Robert, to “reinvent” the cider industry. From apple tree to bottle, they created organic ciders for all palates, from the delicate to the intense. 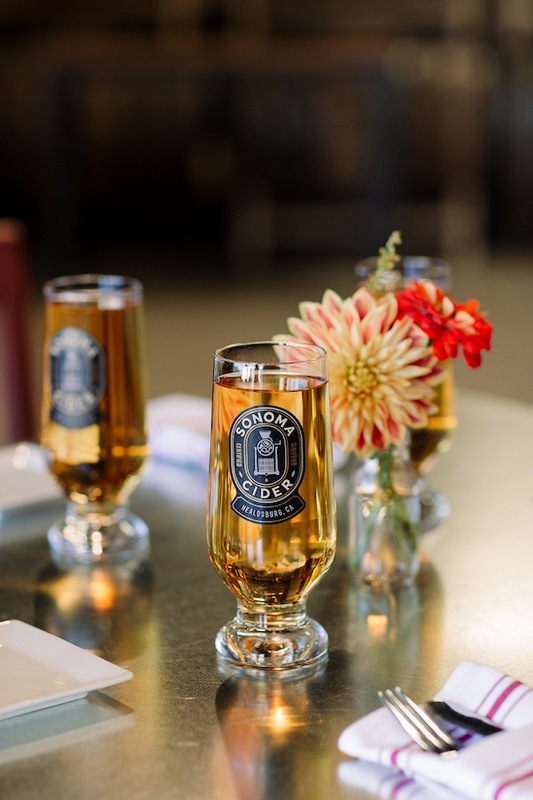 Five years later, Sonoma Cider is distributed in 24 states. With business success came a desire to expand. 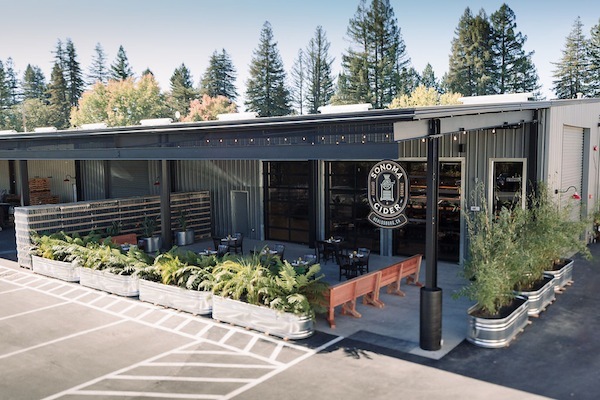 Last year, the father-and-son team opened the Sonoma Cider taproom on the same site as their production facility in downtown Healdsburg. The result is a perfect place to lounge away the day, sipping cider on the patio. The taproom was designed to have, as Cordtz describes it, “honest simplicity, authentic materials, and a rural, relaxed environment.” Goal achieved. Just one block away from the bustling Healdsburg Square, the 5,500 square-foot taproom feels like a respite from the winetasting lounges and posh cocktail bars. Plus, it’s all family- a nd dog-friend ly, with lots of cider, beer, wine, food, games (ping pong and corn hole) and live music. On a recent visit, I sat on the spacious patio sipping a flight of six taproom-exclusive ciders and enjoying the sunshine. The flight was a mix of mainstays like the Hatchet and special micro and limited-run ciders. The Gravenstein is made from, no surprise, organic Gravenstein apples. It tastes as it should, a tad sweet with a bit of a bite, and a flavor that had me closing my eyes, imagining I was listening to blues music at the Apple Fair. I also sampled the Westcider, which uses five different organic apples from Porque Ranch, a two-acre orchard southwest of Healdsburg. T he blend is u nique and mild, with a low 5.7 percent alcohol content and low sugar level. If you like dry ciders, this is for you. Other unique choices include the Bananaweizen (apple juice fermented with hefeweizen yeast and bananas), the Crowbar (bone-dry cider with organic lime juice and habanero peppers), and the Imperial, which is aged for six months in whiskey barrels. To fuel me through my flight, I needed food and the taproom has plenty of that. Their menu is comprised of small and large dishes, —many gluten-free and vegan, —that use locally sourced ingredients. 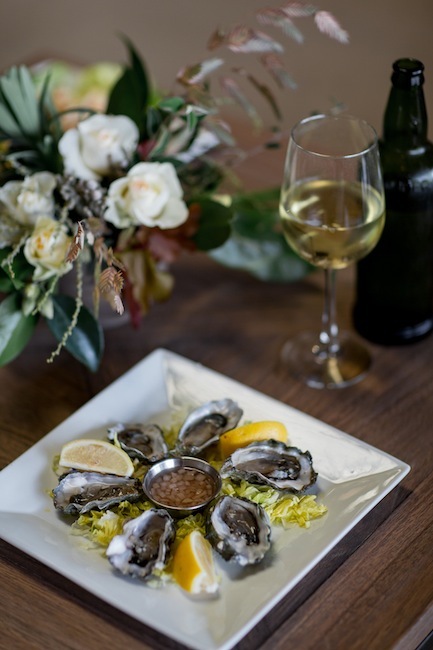 Pub classics include Mary’s organic wings served with a side of barbecue sauce made with Sonoma Cider’s own Anvil cider, mac n’ cheese (add crab and blue cheese for a touch of decadence), and a French dip sandwich served on Costeaux French bread. Vegetarians and vegans can chow down on house made pickles, Brussels sprouts with roasted organic apples, pistachios, and a marinated portobello. I closed out lunch with a salted caramel gelato served between two Costeaux chocolate cookies and washed down with a glass of Dry Zider (cider aged in Zinfandel barrels). It was time to burn some calories. In the heart of the taproom is a game area, where my companion and I played pin g-pong, followed by a rowdy game of corn hole with a couple of locals, all nestled next to cider making equipment and the taps. T hat night, a local band would play on the nearby stage and cider-induced toasts would ensue.